A charming temple town, famous for its ancient Hindu places of worship, Kumbakonam is perched in Thanjavur District of Tamil Nadu. Pilgrims and tourists who wish to witness the significant temples of India should come here without second thought. A few of them are Nageswaran, Adi Kumbeswarar, Brahma and Kasi Viswanathar. The holy town is also famed for the Kumba Mahamaham held every 12 years. Pilgrims come from all around the world to take a sacred dip in the Mahamaham tank which is deemed to wipe away all the sins committed in the lifetime. Apart from religious importance, the town is also eminent for silk products, electrical goods and prominent educational institutions. 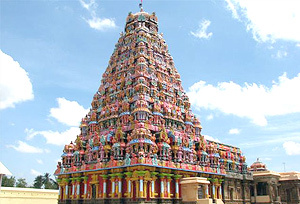 Attained much praises on south India tour, Kumbakonam beckons its visitors for a remarkable experience. India's most primeval city built up in 3rd century is Kumbakonam. It was first ruled by Pallava Kings from 4th to 9th century. After them, Cholas dynasty took over who erected many significant shrines; the most legendary one among all is Brihadeswara Temple in Thanjavur. After the fall of Chola empire during the mid of 12th century, the place came under the rule of Pandyan Dynasty. Their rule went on till 14th century. Subsequently, it was the capital of the Vijayanagar Dynasty during 14th century. Krishna Devaraya II, the ruler of Vijayanagar paid a visit to the place somewhat in the year of 1524 and it is said to have taken a dip in the celebrated Mahamaham pond. Between 1535 and 1673, Kumbakonam was conquered by Madurai and Thanjavur Nayaks. The town was outstanding in art, culture and literature only in the Cholas era, a period termed as the golden era. Abhimugesvarar Temple: A famous temple in the holy town of Kumbakonam, Abhimugesvarar Temple exhibits the vividness of old south Indian structural design. The temple has also installed an idol of Goddess Amudhavalli, the companion of Abhimukeshwara. It allures a great number of pilgrims and religion enthusiasts from all over during the fair of Mahamaham. Bhagavatha Padithurai Ghat: Bhagavatha Padithurai Ghat, a holy bath that is said to wash off all the sins of a person, is situated in Kaveri River. Thousands of devotees visit this sacred place during the Mahamaham fair to make his body, mind and soul pure. Gowthameswarar Temple: Devoted to God Yagnabhaveetheswar and his companion Goddess Sundaranayagi, Gowthameswarar Temple is amongst the famous holy sites in the revered town of Kumbakonam. The devotees visiting this shrine worship god and goddess after taking a dip in the Mahamaham Tank. Kanchi Kamakoti Peetham Mutt: Founded by Sri Adi Sankara in 482 BC, Kanchi Kamakoti Peetham Mutt is a main destination to visit while on Kumbakonam tour. Nageswarar Temple: Also dubbed as Nageswara Swami Shrine, the temple is among the most notable Shiva temples in the town. It is deemed that Adisesha underwent penance here and later got blessed with immense power by Lord Shiva and his consort Goddess Parvati. Venkatachalapathy Swamy Temple: One of the illustrious temples of Vaishnavas, Venkatachalapathy Swamy Temple is situated just 2 miles from the sacred town of Kumbakonam. The main god is hailed by various names like Oppiliappan, Thiruvinnagar appan, Venkatachalapathy and so on. Its structural design is very beautiful with Gopurams which are decorated with scriptures of the ancient period. By Air: Trichy is the closest airport to reach Kumbakonam, just 96 km away. Travelers coming out of the country can get down at Chennai International Airport, situated about 273 km from the town. By Rail: Kumbakonam is well connected by trains with Chennai, Rameshwaram, Kollam, Tirupati and many other destinations of India. By Road: Travelers can take private buses from Chidambaram, Bangalore, Thirunallar, Trichy, Chennai and other cities of the state to arrive at Kumbakonam.